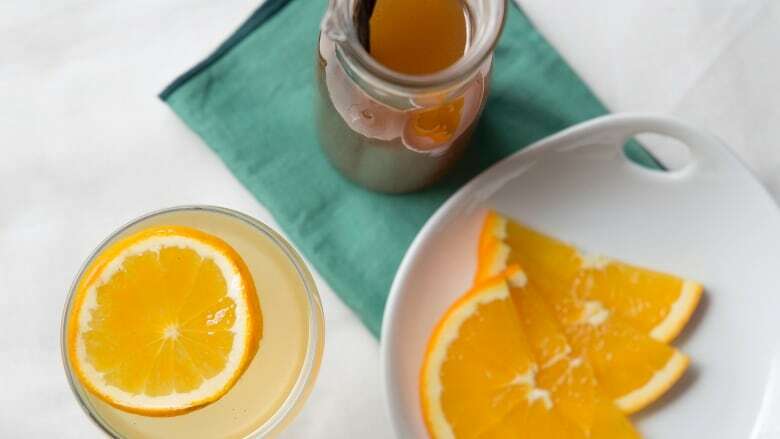 3 syrups to make delicious brews for drinkers and nondrinkers alike. Warming flavours are a favoured respite from a blustery weather — or just a hard day! — and we’d argue that the mixes below will leave you feeling as cozy as your favourite sweater. They don’t call them simple syrups for nothing; these are so simple to make and they payoff is delicious. Not only will you have an easy way to add excitement to club soda (finally, a non-boring drink to serve guests who aren’t imbibing, which is so right now), you’ll also be one step closer to making an impressive cocktail. They will keep two weeks in the refrigerator. Make them in advance so you have them on hand for guests or to treat yourself. Using a vegetable peeler, gently peel the skin of the orange, removing only the fragrant zest (orange surface) and avoiding the bitter (white) pith. Cut the orange in half and juice it; it should yield approximately ⅔ cup of juice. Combine the orange zest, juice, water and brown sugar in a pot. Cut the vanilla bean in half and scrape the seeds out. Add the seeds and bean into the pot. Heat the mixture on high until it boils. Reduce to low, stir until sugar has completely dissolved. Simmer uncovered for 30-40 minutes until the liquid has reduced by half. Turn off heat and let cool. Pour the syrup through a strainer and into a jar. Add the vanilla bean but discard the orange peels. For a orange vanilla soda, use 2 oz of syrup for every 250 ml of club soda and serve with ice. To make a cocktail, combine 1.5 oz of the syrup, 2 oz of vodka and ice in a shaker. Shake vigorously and strain into a glass. This syrup is also nice in an Old Fashioned. Replace the sugar with 1 oz of the orange vanilla syrup. Combine the cider, cinnamon and sugar in a pot. Heat the mixture on high until it boils. Reduce to low, stir until sugar has completely dissolved. Simmer uncovered for 30-40 minutes until the liquid has reduced by half. Turn off heat and let cool. Remove cinnamon sticks and pour the syrup into a jar. To make apple cider pop, use 2 oz of the syrup for every 250 ml of club soda and serve with ice. Stir to incorporate and garnish with a sprig of rosemary. For a cocktail, add 1.5 oz of rum and garnish with a bit of rosemary. Combine all of the ingredients in a pot. Heat the mixture on high until it boils. Reduce to low, stir until the honey has been completely incorporated. Simmer uncovered for 30-40 minutes until the liquid has reduced by half. Turn off heat and let cool. Pour the mixture through a fine mesh strainer into a jar, and use a wooden spoon to push the ginger against the sides to squeeze out the liquid. To make a sweet and sparkling ginger drink, stir 2 oz of the syrup for every 250 ml of club soda and serve with ice. For an alcoholic cocktail, add 1.5 oz of scotch or rum. Andrea Chiu is a freelance journalist, cocktail enthusiast and dog-lover. Find her on Twitter and Instagram at @TOfoodie.